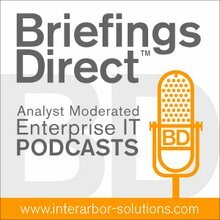 This latest BriefingsDirect podcast, from the recent 2013 Ariba LIVE Conference in Washington, D.C., explores how the spot-buying process is benefiting buyers and sellers, and how they're using the Ariba Network and Discovery to conduct tactical buying. Gardner: Tell us about Koozoo. Thomson: Koozoo is a technology company based in San Francisco, and we are the easiest way to share a live view with someone in particular, or a broader community. We have built a very simple web application that converts your old smartphone into a geolocating webcam. For example, you would pull the old smartphone out of your sock drawer, or whatever drawer that you have it in, and you dust it off. You go over to your WiFi network and download the Koozoo application, and that now makes your phone a webcam that you can stream and point to a website, if you had a website that you wanted to display it on, or on to the Koozoo site, where it could be private for your consumption. On a personal level, it could be to make a baby monitor or something like that for a limited community, like a neighborhood watch group or merchant association that wanted to share their views or more broadly on the Koozoo community. If you look at Koozoo, it looks like we're making equivalent of Google Street View, but live. Right now, we're limited to San Francisco, but were able to see what's happening around town. Gardner: That’s really interesting. There is plethora of end devices that have cameras and WiFi, and you're able to then take advantage of that and give people the opportunity to innovate around the notion of either public or private streams. Is it just live stream? How can people just take a photo view every minute or six minutes, or anything like that? Thomson: Not just yet, but that is certainly the direction we are moving in terms of building an ecosystem that allows you to make alerts for a certain movement or alerts when there are certain sounds that are anomalous, and are ones that you would want to record or see. But now, it's just an ambient streaming. Right now, we support the iOS suite, an iPad or an old iPhone, later than the 3GS generation. Before that, they didn’t have the necessary hardware components, the chip set, to support live streaming the way we do live streaming with encoding. We are on some Android platforms, but Android is a very fragmented market, and as you develop toward Android, you have to keep that in mind. So we focus on certain platforms within the Android market first. As we define this product market fit, we will develop the app and then propagate the Android market. Gardner: So you're a startup -- resource constrained is, I believe, the way people would refer to that -- and you still need to buy and sell goods and services. When you were tasked with something that wasn’t a strategic, organized, or recurring type of purchase, how did you find what you needed, and how did Ariba factor into that? Thomson: We're not really a buying organization per se. We're an engineering-based company. We have very few people and, when we need to buy something, it's usually something like walking over to Office Depot and picking up a couple of pencils, because we need pencils. As I got smarter about what I needed, I was able to communicate that with the potential vendors. Primarily, we had been looking at Amazon for that sort of purchase. As soon as we needed to purchase a few more things, we moved from pure retail to more of a wholesale sort of a buyer. We needed to buy more phones to do testing on. We looked at Alibaba and we looked at Amazon, primarily because I had only heard of those two, to buy larger quantity of used mobile phones in this case, because I wanted to take advantage of refurbished phones being more cost-effective for us for testing. Initially I found Ariba through an introduction. Somebody said, "If you're looking at Alibaba, why don’t you look at Ariba? It's more suitable for what you're looking for." And it certainly turned out to be the case. Initially, we made that one purchase and subsequent purchases of mobile devices. It turned out to be a really good mechanism for doing some market analysis. I didn't know what I was buying. I'm not a mobile device expert, and I don’t come from consumer electronics. I was able to learn about what it was I didn’t know and be able to iterate on my request for a purchase. I was able to iterate on that publicly, so that everybody got to see. As I got smarter about what I needed, I was able to communicate that with the potential vendors. Gardner: Because we're here at Ariba LIVE, the conference, we've been hearing news from Ariba about spot buying as a capability they're investing in and delivering through their network and Discovery process. Is there something about having a pre-qualified list of suppliers that in some way benefited you or gave you a sense of confidence vis-à-vis going just on the open World Wide Web. Thomson: I don’t mean to be disparaging, but that was a little bit of the experience on Alibaba. I did get a ton of responses that weren't necessarily qualified and they weren't qualified, because they hadn’t read my request very clearly. They were offering me something that clearly wasn’t supporting what I needed, but rather was supporting what they were trying to sell. I had done some Google searches and tried to find vendors, whether it was for these used devices or for a specialized widget that I needed to have made and sourced. So doing that on Google was pretty tough, time consuming, and something that I wasn’t expert at. I didn’t have the capability to ask the right questions. I didn’t even know whether I was in the ballpark of what expectations should be in terms of time for delivery, cost, or what an acceptable small batch really was, because initially I needed a small batch to test the product that I was developing. I see how we could position our profile on Ariba Discovery to respond to inbound interest on that platform for something that we could solve. I don’t really see us ever becoming a very large buying organization. If we continue to develop this product, we already have a group of two or three suppliers that we've developed our relationship with over Ariba Discovery, which is the the spot buying platform that they have. I don’t know if I necessarily would need more. I don’t know what our procurement needs are going to be moving forward. We're a little bit more interested in looking at it as a way to respond to potential leads. I'm on the sales side, not on the procurement side of our company. As I look at moving forward, we do need to capture new leads. I see how we could position our profile on Ariba Discovery to respond to inbound interest on that platform for something that we could solve, whether that’s a surveillance system, a public safety system, or something like that. We would certainly be a very cost effective solution for that. So to be able to respond to inbound interest could be a very good place for us to go. Gardner: So, it's a two-way channel. You were able to use Ariba Discovery and spot buying to find goods and services quickly and easily without a lot of preparation and organization, and conversely, there might be a lot of buyers out there using Ariba Discovery looking for a streaming capability and you would be popping up on their lists. Have you done that yet? What's the plan? Thomson: That would be the hope, that there are a lot of people that want to buy it and use it. I haven't focused on that just yet. As a company, we're in a product-development cycle, not really in the business development sales cycle just yet. Ariba could be a very good way of figuring out what the market wants. Gardner: So, it's not just a sales execution channel, but also a market research and business development channel, finding out what's available. You don’t know what people want, until you get it out in front of them, and of course, the spend for doing that through advertising or direct marketing is pretty daunting. Something like Ariba Discovery gives you that opportunity to do sales and research at no cost.